At a meeting of the Oireachtas health committee. 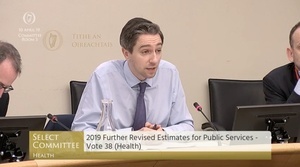 Minister for Health Simon Harris mentions those posters outside his constituency office..
Mr Harris responded that he “disassociated”himself from the language of Senator Mullen and that he will campaign for a Yes vote. Posted in Misc and tagged 8th amendment, Oireachtas Committee, posters, Simon Harris at 4:44 pm on May 9, 2018 by Bodger. If you know of anyone killing children, please phone the Gardai immediately on 999. PS Can you also please tell me why I’m suddenly suspicious that YOU are behind these atrocious, revolting posters? Because he’s an atrocious, revolting person. 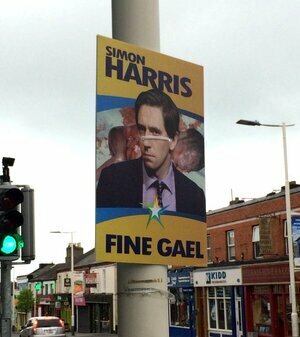 Good on Simon Harris, not kowtowing to Mullen. 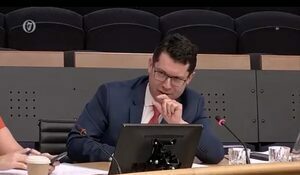 Ronan Mullen- an abundance of irrelevance. 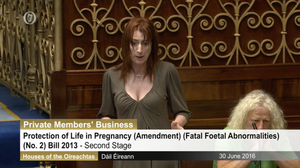 Ronan Mullen: another pro-lifer who has to date thwarted his sperm in the creation of life. Some might say thankfully, but that’s another day’s work. He’s nuthin but a lowdown sperm murderer! Actually, I’d bet money that Ronan is probably the one man in Ireland who doesn’t indulge in the sin of Onan. And that’s why he’s such an angry, frustrated, nasty little clockwomble. Possibly. But he’s still letting them wither and die on the vine, so to speak. Which ought to be a punishable offense. Plop his face on a poster with any number of Church atrocities in the background and spin that question around. Absolute goon. I’m betting he wears the ceremonial robes at home. The Met Gala would’ve killed to have his collection on display. And very tight underpants. Tighty whiteys to dye for. So you’re saying abortion is an atrocity Paul? Think he’s saying plastering a town with pictures of a miscarriage is atrocious. You may not agree, but you’re probably not a woman who’s had one or multiple. Knowingly plastering that kind of stuff around where potentially THOUSANDS of women who’ve miscarried can see them is fupping disgusting. No ifs. No buts. No whataboutery. You either agree or you’re letting the mask really slip on misogyny. I don’t think that’s what Paul was saying. He was equating one thing with the other in the background of a poster and calling them atrocities. Your comments are getting a bit desperate at this point. He may be suggesting that posting explicit photographs of a miscarriage on a public street is an atrocious act. Other atrocious acts include pedophliia, child abuse and Church cover ups of pedophiles and child abusers among its members. All atrocities. This is great craic altogether. Can anyone else say the names of some atrocities? teaching people guilt, shame and fear to control them for financial and political ends…. Who is saying anything about killing children? Bringing women to the brink of death or letting them die to save a fetus maybe, that’s a type of killing. There’s literally no redeeming qualities to Mullen. Remember folks – he’s a board member of HUNDREDS of state-funded schools in Ireland. I did not know that. Is there a list of them to avoid? Check out CEIST – it’s a trust all the child-beaty-rapey-abusey orders put their schools and property into to avoid having to recompense the children whose lives they ruined or that kind of jazz. Great stuff. Thanks for that ahjayzis. Very helpful. No according to this. Has he left? Serious question. Both Senator Mullen and Senator Bacik have not been to the fore in print media or radio/tv on this referendum debate. Is that a deliberate decision of both the No and Yes camps respectively? Senator Bacik has had a few letters in the Irish Times – but that would be her personally – rather than the Yes camp. I’d say it’s deliberate. One of them is more off putting than the other. She’s one of those people who makes me instantly reach for the Off button if I hear her on the radio. Terry Prone would be another. Staaanndd don’t deliveerrr. It not yet a real life. Harris is a strong politician. 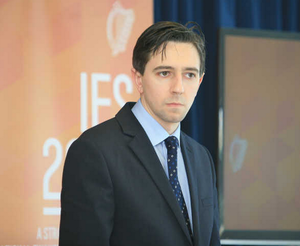 He’s been “waterboarded” with HSE adversities as a new minister. Feels like it’s against Geneva convention on torture, really. Nature of the job though, sadly. He’s got my respect, hope he gets all the support he is due. I really hate how we pity the ministers for health. I sometimes think that’s why we end up with an absolute mess of a health service. Is he, I haven’t seen anything that would back up this assertion. He’s not a strong politician. He gave that impression prior to being given a ministership with his rat-a-tat-tat method of discussion. Lauded by his party as a potential future leader. That was very soon knocked out of him when he actually got some responsibility that he has failed miserably with. Maybe, just maybe, he could have eked out some respect by actually coming through the back benches over a longer period of time, but like Varadkar and Murphy he got high office almost instantly only to be proven a boy trying to do a mans job. 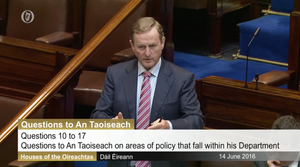 Kenny punished Varadkar (the heir apparent to the Fg Leadership) by giving him health and Varadkar did likewise to Harris. Harris hasn’t dealt with it well, and is under severe pressure in his constituency. The only waterboarding done was by Varadkar. There will, presumably, be a GE in the next year or so, and after that, an ‘election’ for the Seanad. There’s got to be a strong enough candidate somewhere to take Mullen’s NUI seat as long as the electorate actually turns out. I can’t believe he represents the views of a majority of graduates. The problem is limiting it to only one strong candidate. Mullen gets elected with about 9k votes. But the anti-Mullen votes get spread between 10+ candidates. He use single transferable vote – so as each of the 10+ get eliminated their transfers are counted for the remainder. Doesn’t help that Simon looks like a ghoul. Get a tan dude! I think Ronan Mullen dresses in a very stylish yet affordable colour coordinated manner. it’s what every Amateur Gynaecologist should be wearing this season. Again, like Paul above, you are suggesting that abortion is as bad as paedophilia or the protection of paedophiles. It’s nice to know where ye stand on this. Hold on now. Two different people have suggested replacing the pictures of an aborted foetus with bad stuff the church has done. They’ve directly compared abortion with “atrocities” and paedophilia. I think you should all calm down for an hour and watch a couple of large breasted French lesbians dance to techno. I find it very relaxing myself. Parfait pour le début d’un jour férié.